Are you shopping for the best dog nail grinder? This article will help you sort through the best rated dog nail grinder models in the market, and find the right one for your pet. They are as important tool as electric dog clippers, and we highly recommend purchasing one as soon as possible. Experts recommend the use of a dog nail grinder because it is a safer alternative to dog nail clipper. Dr. Marty Becker says it is easier to avoid the quick of a dog when you use a nail grinder. Some dogs may find the sound that nail grinders make annoying, as mentioned in the Daily Herald. But generally speaking, this paw care tool is easy to use for most dog owners. In case your dog has a bad personality and is often too loud, you can always get some of these harmless shock collars to solve the problem. What Are the Best Dog Nail Grinders? This could be the best small dog nail grinder today. It is equipped with a unique mute technology to prevent dogs from getting scared. It is also lightweight and powerful. This paw care tool features a diamond-bit grinder. It is designed in such a way that the risk of clipping the claws too short, or cutting the quick, is significantly reduced. This is a small electric nail grinder that is ideal for use in small to medium sized dogs. Basing on reviews on Amazon.com, satisfied users have used it to shorten the nails of dogs like Shih Tzu and boxer dogs. Because it is small, dog owners with small hands should have no problems using it. You should be able to hold it well, even if you are dealing with a squirmy dog. Dogs are notorious for resisting the noise made by dog nail grinders. But this nail grinder should not make noise loud enough for him to get distracted. With its unique mute technology, the nail grinder operates within 60 decibels. It is also designed to operate with low vibration. 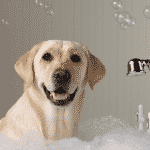 Your pet should be able to stay still long enough for you to groom him. There are also three openings or ports in the grinder area, so you can use this grinder to shorten and smooth out the nails of different dogs. In fact, you can also use this in smoothing rough nails of cats and hamsters. This is a cordless nail dog grinder that makes use of two AA batteries. Because of its design, it is very easy to put this in your pocket or bag. It’s a convenient travel companion, too, if you like to bring your dogs with you in your trips. You won’t have to spend a lot of effort and time in cleaning your area after using this pet nail grinder. It has a plastic cover that prevents nails and cuttings from flying around. The cut nail stays in the kit. This is not the type of dog nail grinder that you would want to use on a big dog. Many disappointed reviewers on Amazon.com say it doesn’t work well, too, in shortening long dog nails. If you ask majority of reviewers on Amazon.com on what is the best dog nail grinder today, then they could point out to this product. This cordless dog nail grinder is one of the top rated dog nail grinders on Amazon.com. Satisfied owners say it is very easy to use, quiet, and powerful enough to shorten the nails of their dogs. There are two speed settings available on this dog grinder. You can chose between low or high speed, depending on the comfort level of your pet and your skill level. The dog grinder has a very good build. 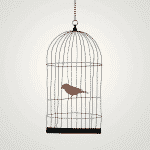 Many reviewers say that it is easy to hold and control. This should make it easier for you to shorten your pet’s nail. This is dog nail grinder that is very convenient and easy to use. For starters, it comes with a rechargeable battery. You don’t have to buy replacement batteries, as such, which means that you get to save more in the long run. Recharging the battery only takes less than three hours. There is an LED light that tells you that the battery has been correctly placed into the charger for proper charging. Since the grinder is cordless, you don’t have to worry about the cord getting entangled with your dog’s legs. Many reviewers on Amazon.com also agree that the noise that this dog nail grinder makes isn’t loud enough to bother dogs. They say that while there’s some noise, it is very minimal. It won’t be enough to distract dogs and scare them away. There are mixed reviews on the battery life of this grooming tool. There are a handful of reviewers who say they are disappointed with the battery life. Others also hate that there’s no way for them to tell if the battery is about to get drained. Thus there’s always the risk that you could get caught with drained battery while in the middle of a nail grinding job. This is another portable, cordless grooming tool that you may want to consider for your dog. It is powered by two AA batteries, with a protective guard that makes cleaning a lot easier. It can also work for cutting nails of small and big dogs. Upon opening the box, you will notice right away how lightweight and compact this dog nail grinder is. It is smaller and lighter than the Dremel model. It takes AA batteries, although you can also use rechargeable ones if you want to save on expenses in the long run. Because it is small and lightweight, this dog nail grinder is very easy to store. You can easily put this in your drawer. Using it to smooth your dog’s nails won’t also be a problem. It operates very quietly at 60 decibels. Many reviewers on Amazon.com say that this dog grinder doesn’t disturb their pets when they use it to shorten their dog nails. There are three ports in this grinder. The first port is suitable for shortening the nails of small sized dogs. The second port is for large and medium sized pets. The third port is for grinding fast. Many reviewers also liked that this grinder has a unique ergonomic design. They say that it is lightweight and designed to fit hands well. Let’s just say it is unlikely you will lose grip in using this dog grinder. And even if you use it for an extended period, like when you smooth the nails of multiple dogs, it is doubtful that your hands will get tired from using it. Operating this dog grinder should not puzzle you at all. You can refer to a short user’s guide located at the back of the product. Of course, there are some things that owners didn’t like about this dog grinder. A common complaint is that the dog grinder isn’t as effective in shortening the nails of big dogs. Other reviewers complained that it is a bit slow that it would take a while for them to shorten the nails of their pets. This is another affordable, lightweight, and easy-to-use nail grinder for dogs. It practically eliminates the need for claw clippers. It also presents an easy and stress-free way of trimming the nails of dogs, instead of using nail clippers. It is also safe to use than nail clippers. It is constructed with a diamond bit grinder which is a lot safer compared to nail clippers in trimming the nails of dogs. You won’t have to worry about cutting the quick of your dog with this nail grinder. This is a cordless dog nail grinder that is very easy to maneuver. Aside from that, it is also very lightweight. It weighs just 4.8 ounces. Reviewers on Amazon.com thus have good things to say about how easy it is to use this on a wriggly pet. It is ergonomically designed, too, so users will have an easy time holding on to it. The grinder fits most hands of those who have used it, based on the reviews on Amazon.com. It is also quiet when in use. The manufacturer claims that the unit operates within 60 decibels. Most reviewers on Amazon.com describe the sound that it makes as a buzzing sound. They agree it isn’t loud enough to scare away their pets. Like most of the grinders in this review, this unit is powered by a couple of AA batteries. The manufacturer throws in a couple of AA batteries in the product package. While some reviewers wish that this dog grinder comes with a rechargeable battery, others point out that this grinder can also take in rechargeable AA batteries. Others say that they like that it uses AA batteries which can easily be bought at any store. The consensus among reviewers on Amazon.com is that this dog grinder is best suited for use in small to medium sized dogs. There are customers who say this unit struggles in cutting nails of dogs who weigh at least 30 pounds. Others also say this grinder isn’t the best when it comes to cutting long and thick dog nails. Similar to the items preceding it, this dog grinder has troubles cutting nails of big dogs. But if you have a small to medium sized dog, then this nail grinder should be a good buy for you. Despite that issue, there are lots of things you will love about this dog nail grinder. One is that it comes with a LED light. It is one of the few dog nail grinders with this feature. Don’t think that the LED light is a mere marketing gimmick. It does have its use. It illuminates the clear guard, so you can do a better job of shortening your dog’s nails. This dog nail grinder also doesn’t make a loud noise that can bother dogs. Reviewers on Amazon.com describe the sound as moderate. Most reviewers say that their dogs were not at all scared by the sound that the motor makes. There are some customers, though, who say their pets eventually became used to the noise. The grinder is powered by twoAA batteries. The manufacturer includes four AA batteries in the package. Some reviewers complain that the dog grinder can drain batteries fast. As such, they suggest storing several AA batteries so that you won’t get caught with drained batteries while in the middle of a grinding job. This cordless grinder has a two speed setting—high and low. Customers on Amazon.com that the speed settings are good enough for dog nail grinding. The slow speed setting is ideal for grinding thick dog nails. Aside from the fact that the batteries drain fast, a common issue that users have with this unit is that its high setting is still slow enough for them. Others are also not satisfied with the build quality of the nail grinder, saying it appears to be cheaply made. But if you are looking for an affordable and easy to use nail grinder for your small pet, then the FURminator nail grinder should be in your short list. This is another cordless nail grinder that you can use for your dogs. Aside from being extremely quiet, it comes with a lot of attachments like a clipper, nail trimmer, cleaning brush, and combs. While the attachments would come in handy for grooming your dog, make no mistake about it—this is still a tool that you can rely on in shortening the nails of your dogs. One of the best qualities of this dog nail grinder is its built. Despite being affordable, you can’t tell that it is a low priced grinder when you see the way it was constructed. Many reviewers on Amazon.com commend the manufacturer for coming up with a well-designed dog grinder. They say that it is lightweight yet feels solid in hand. They say it is comfortable to hold even for an extended period. Most satisfied owners also wrote on Amazon.com to express how glad they are that this nail grinder is very easy to operate. They remark that the grinder has an anti-skid switch which makes the unit even easier to use. This unit runs on a single AA battery. However, you should be aware that the unit itself doesn’t come with any battery so you will have to buy your own to get this thing going. As far as battery life is concerned, the reviews are mixed. There are some reviewers who complain that the battery life isn’t that long. Others, on the other hand, say they are pretty much satisfied with the battery life. This unit doesn’t come with a battery charger, though. It’s quite understandable for a dog nail grinder that is as cheap as this one. Like the comments in most of the dog nail grinders in this review, this unit appears to be not the best choice for owners of big dogs. Reviewers on Amazon.com agree that it doesn’t work that well in trimming long and thick nails of big dogs. This is another dog grinder that is more suited for shortening the nails of small and medium sized dogs. It is a safe and effective alternative to nail clipper, especially if your dog is the wriggly type. It has a very quiet motor that operates within 60 decibels. Most reviewers on Amazon.com agree that their dogs don’t get scared when they use this on them, because of the minimal noise it makes. This dog grinder also comes with a plastic cover. This is designed to prevent nails and cuttings from flying around. It can make your life easier as you don’t have to clean after trimming your dog’s nails. The unit takes two AA batteries, which are included in the package. Operating it is very straightforward. Simply put the batteries, switch on the unit, and then insert your dog’s nail into the appropriate hole or port. Weighing less than 120 grams, this dog grinder is very lightweight. It is made of ABS resin and PS resin. It is also very comfortable to hold. Owners say that it feels solid in hand. Because of its size, this dog grinder is also very easy to store. This dog has three ports, with the first port ideal for use in small dogs. The second port is for medium sized dogs, while the third one is for big dogs like Saint Bernard. However, most reviewers on Amazon.com doubt that this dog grinder is that effective in trimming the nails of big dogs. One reviewer shared that the third port is barely enough to fit the claws of his 65 pound and 75 pound dogs. And even if you are able to place the claws of your dog into the port, the nail grinder doesn’t really have enough power to trim thick and long nails. 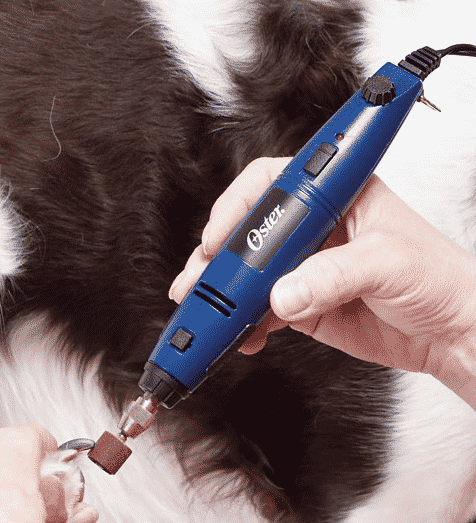 If you are worried about your dog’s safety in using a nail grinder, then you might want to check out this Oster Gentle Paws nail grinder for dogs and cats. It features an adjustable safety guard that ensures you won’t be trimming your pet’s nails too closely. You can choose the Safety Guard opening appropriate with the nail size of your pet, then start to file each nail. This is also a cordless dog nail grinder that is very convenient to use. It is designed for one handed operation. It has two speed settings to choose from, with a quiet rotary motor that shouldn’t distract the pet nail grinder. Make no mistake about it—the dog nail grinder still makes some noise. But it isn’t too loud enough to scare away dogs. Even the provided manual acknowledges that the dog will have to get acclimated to the noise coming from the nail grinder. This nail grinder also appears to be well built despite being very affordable. One reviewer commented that it doesn’t have flimsy parts that other cheap grinders are notorious for. It also comes with a one year warranty. This nail grinder takes four AA batteries. Most reviewers on Amazon.com cite that this gives the nail grinder another advantage, as AA batteries are readily available. Some even say they simply change the battery placement when the dog grinder loses power. However, be cautioned that the number 2 speed (fast) won’t work when the battery is low. Many reviewers on Amazon.com also say that they are quite satisfied with the battery life of the nail grinder. It would have been better if the grinder came with a charger but you can’t really expect a lot from an affordable unit such like this. Of course not all of those who have bought and used this on their dogs are satisfied with it. The usual negative feedback that this dog nail grinder has been getting is the lack of power for thick and long dog nails. Pet owners who have used this on their dogs also say it doesn’t a good job at all in trimming the nails of large dog breeds. The main selling point of this pet nail grinder is its noise level. To be more precise, this nail grinder is one of the quietest around. It operates within 50 decibels, with a buzzing sound that Amazon.com reviewers say don’t irritate their dogs. The sound coming from the rotary motor should not be a distraction at all for most dogs. Thus you can have a better shot at shortening the nails of your dog. You won’t have to bring him to a professional grooming service at all. Aside from being ultra quiet, this nail grinder also comes with a rechargeable battery. It has a micro USB port that you can use for charging the pet nail grinder. A lot of satisfied owners on Amazon.com are happy that this dog nail grinder has rechargeable batteries. They say that they get to save more in the long run because there’s no need to buy replacement batteries every now and then. Plus another good quality of this rechargeable dog nail grinder is the long battery life. Although there is no battery life indicator, the unit doesn’t drain batteries that quickly so you don’t need to re-charge the battery frequently. Since the dog grinder is cordless, it is a lot easier to maneuver it when shortening the nails of dogs. It also works well in dealing with a dog who’s very wriggly. The dog nail grinder also comes with a safety guard. It is designed to prevent over-cutting, and cutting into the quick which is very painful and traumatic for dogs. Reviewers on Amazon.com point out that the safety guard is very useful in cutting short nails of dogs. With it, they don’t have to worry about cutting the dog nail too short. And unlike most of the dog nail grinders in this list, this one appears to be very much capable of shortening the nails of large dogs. One reviewer on Amazon.com mentioned that he uses this nail dog grinder in shortening the nails of his three big bulldogs. He says he hasn’t encountered any problem at all in using this nail dog grinder. The main beef that owners have with this nail grinder is how slow it is in shortening their dogs’ nails. They say it would take a while to shorten long and thick nails. This dog nail grinder also comes with a rechargeable battery. It has a USB cable that you can use for re-charging the battery. You simply plug it into your computer and wait for around 3 hours to get fully charged. This unit has an indicator light that would tell you that the battery has been fully charged. The battery life is pretty long compared to the other models discussed in this list. It can last for about 2 months, which is quite impressive. Another major selling point of this dog nail grinder is it ultra-quiet motor. It is equipped with a unique mute technology that limits the noise of the unit within 50 decibels. Most reviewers on Amazon.com are pretty satisfied with the noise level that this unit makes. They say that it isn’t noisy at all, which allows them to use this on their dogs without their pets getting scared. It also has a plastic nail cover which is designed to prevent cuttings from flying around. Owners say this is a pretty convenient feature, too. With it, there’s no need for them to clean up the work are after successfully shortening their dog’s nails. Like most of the dog nail grinders in this list, this one appears to struggle in cutting short the nails of large dogs. Owners of big dogs shared on Amazon.com that the third port or opening of the grinder isn’t that big enough for nails of big dogs. Not everyone is also happy that the recharging of the battery would take more than 3 hours. Although the battery life can stretch to 2 months, the charging time is still too long for most reviewers on Amazon.com. Another common issue that users have with this dog nail grinder is the dust it creates. They say it is prone to making dust that can get into the eyes of dogs and even lungs of people.